This provided the background setting to a major science festival to celebrate the 300th birthday of the City of Karlsruhe in Germany. In collaboration with the JRC’s Institute for Transuranium elements, Nucleonica also had its products on display. 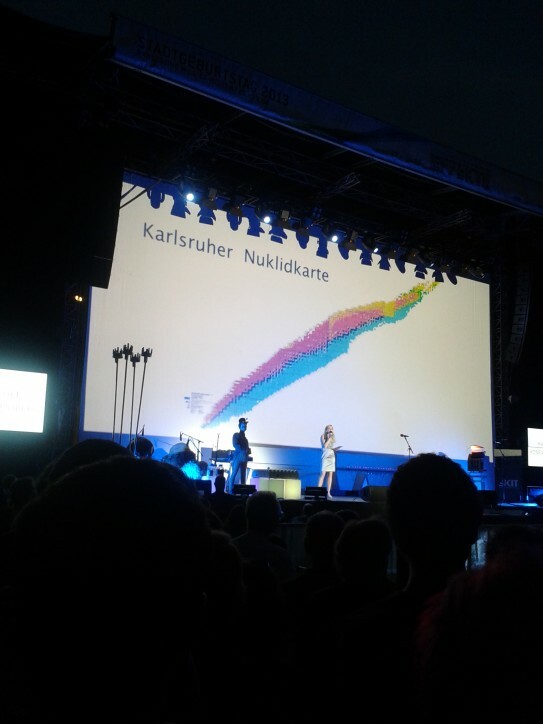 A major attraction was a very large display of the Karlsruhe Nuclide Chart on Saturday evening (22.06.2013) in the castle grounds. The show started at 10 pm on the stage (see image) with the Chart on the background screen. Later on the ITU Director Thomas Fanghaenel introduced a large carpet version and gave a short talk on the nuclide chart. 1. Virtual Cloud Chamber: it is now possible to simulate alpha particles and protons in addition to photons, electron, and positrons. In the example shown, 5 MeV alpha particles are mostly stopped by a very thin layer (40 µm) of tissue. 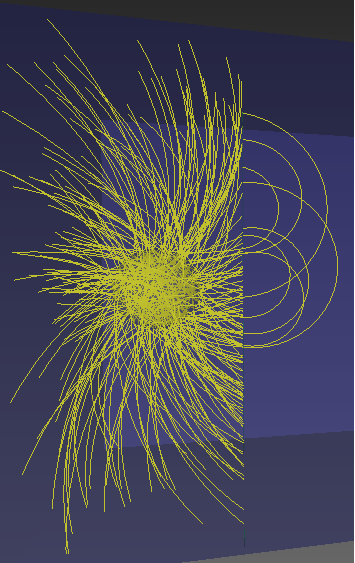 A magnetic field has been imposed to show the alpha particle trajectories more clearly. 2. 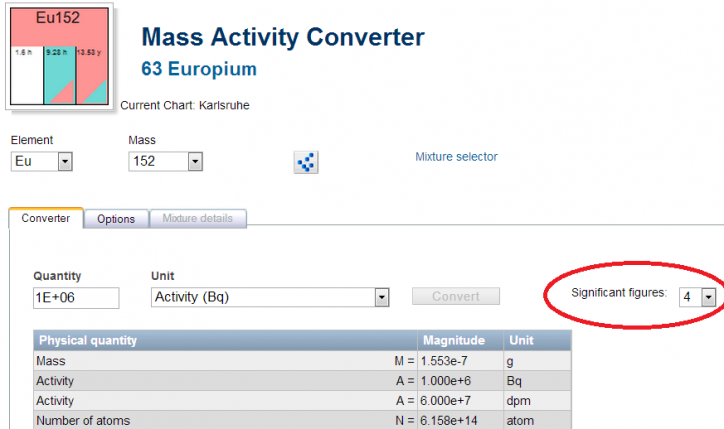 Mass Activity Converter (MAC): the user can now change the number of significant figures in the output grid. 3. Nuclide Mixtures: the mixture grid now contains the number of moles for each mixture component in addition to the total number of moles. 4. From within an application, the user can see the selected nuclide in the Nuclide Explorer by clicking on the Nucleonica icon. 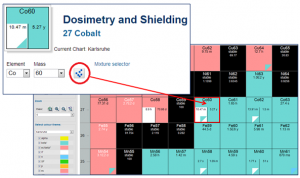 In the example below, the Dosimetry and Shielding (D&S) application shows the nuclide Co60. 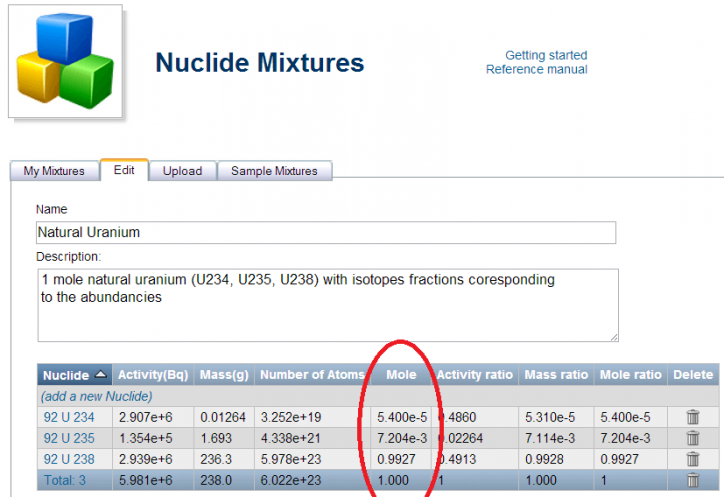 By clicking on the Nucleonica icon, the location of Co60 in the Nuclide Explorer (NE) is shown in a new tab. The user can then switch between the D&S tab and the NE tab. The ENDF/B-VII.1 library, released December 22, 2011 from the Brookhaven National Nuclear Data Centre, is the latest recommended evaluated nuclear data file for use in nuclear science and technology applications. The data library incorporates advances made in the release of ENDF/B-VII.0, including: many new evaluations in the neutron sublibrary (423 in all) and over 190 of these contain covariances, new fission product yields and a greatly expanded decay data sublibrary. The ENDF/B-VII.1 decay data sublibrary is now available in Nucleonica in addition to the previously used decay data library JEFF3.1. It is now possible to compare and contrast the main European (JEFF3.1) and American (ENDF/BVII.1) data libraries for differences in half-lives, branching ratios, energies and emission probabilities of the emitted radiations, etc. using Nucleonica’s user friendly tools. 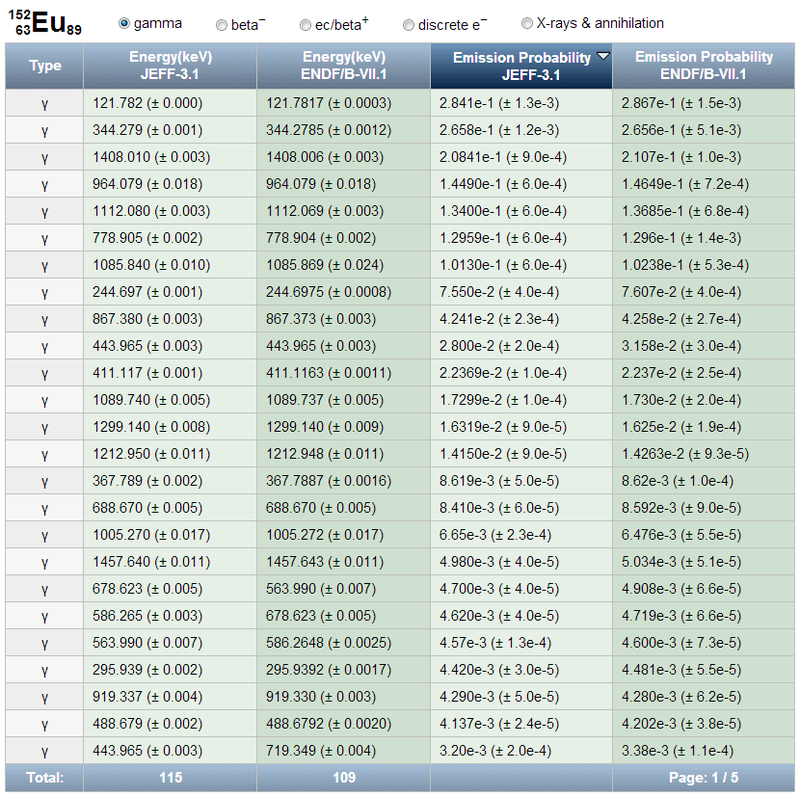 This data comparison can be accessed through the Options tab of the Nuclide Datasheets++ application. Following requests from various organisations, a new high quality Roll Map version of the Karlsruhe Nucide Chart (8th Edition, 2012) has been developed. 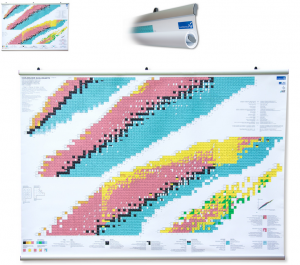 The new Chart, which is now available, is based on the Wallchart but is considerably larger (170x120cm) and is made of a long-lasting PVC. The Roll Map comes with clamping rails and suspension system for easy mounting on a wall. A 52-page explanatory brochure is also provided. Nucleonica for Newcomers: Introduction to Nucleonica’s Core Applications and Tools, 13-14 June, JRC IRMM Geel, Belgium, 2013. 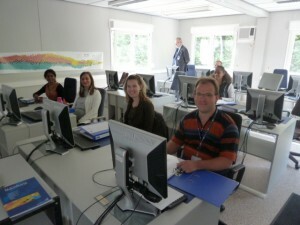 This 1.5-day training course took place at the JRC’s Institiute for Reference Materials and Measurements (IRMM) in Geel, Belgium during the 13-14 June 2013. The course focused mainly on the Nucleonica core applications and tools. A detailed description of nuclear data with particular reference to the various Nucleonica nuclear databases was given. Core applications were demonstrated through the use of Nucleonica tools such as the Decay Engine, and Dosimetry and Shielding. Special emphasis was placed on the Virtual Cloud Chamber application for radiation protection studies and investigating the interaction of charged particles and photons with matter. A case study on Working with Reference Materials showed how the various Nucleonica modules could be combined to fully characterize reference nuclear materials. Speakers included Dr. Z. Soti from the JRC/ITU in addition to Dr. J. Magill and Mr. R. Dreher from the Nucleonica team.